These tables were created using results from replicated processing tomato field trials at the Ridgetown Campus, University of Guelph. Please contact the author for more information on research methods and copies of full reports. The tables are for information only and do not guarantee successful results with the use of any product. Always check the most recent version of the product label before applying any product. Only products labelled for ‘control’ of the specific disease are included in each table except where noted. An Ontario-specific version of fungicide ratings for late blight by Janice LeBoeuf (OMAFRA) was updated in 2017 and is posted here. Fungicide trials for anthracnose management are completed on a regular basis at the Ridgetown Campus, University of Guelph. Only data from trials with high disease pressure were considered in developing these ratings. * Not all products may be registered for this crop-disease combination. Always check product labels before use. **0 (no effect) no difference from control plots that receive no fungicide; + (poor) inconsistent control and/or some effect at reducing; ++ (OK to good) consistent control, does not perform as well as +++ products in all years; +++ (very good) consistent control, consistently one of the best fungicides in the trial. Early blight disease pressure is inconsistent at the Ridgetown Campus, University of Guelph. Ratings represent results of only two efficacy trials when disease pressure was high and significant levels of late blight were absent. *Not all products may be registered for this crop-disease combination. Always check product labels before use. **0 (no effect) no difference from control plots that receive no fungicide; + (poor) inconsistent control and/or some effect at reducing; ++ (OK to good) consistent control, does not perform as well as +++ products in all years; +++ (very good) consistent control, consistently one of the best fungicides in the trial. Septoria leaf spot pressure is inconsistent at the Ridgetown Campus, University of Guelph. Ratings represent results of only two efficacy trial when disease pressure was high and significant levels of late blight were absent. ** Not all products may be registered for this crop-disease combination. Always check product labels before use. **0 (no effect) no difference from control plots that receive no fungicide; + (poor) inconsistent control and/or some effect at reducing; ++ (OK to good) consistent control, does not perform as well as +++ products in all years; +++ (very good) consistent control, consistently one of the best fungicides in the trial. Interested in a product not on the list? If you didn’t find the product information you were looking for, check out the fungicide efficacy ratings from other locations: Wisconsin (late blight), New York (late blight), New York (late blight, early blight). Keep in mind that the efficacy ratings linked above are US sources and not all of the products are registered in Canada, or registered on late blight of field tomato. 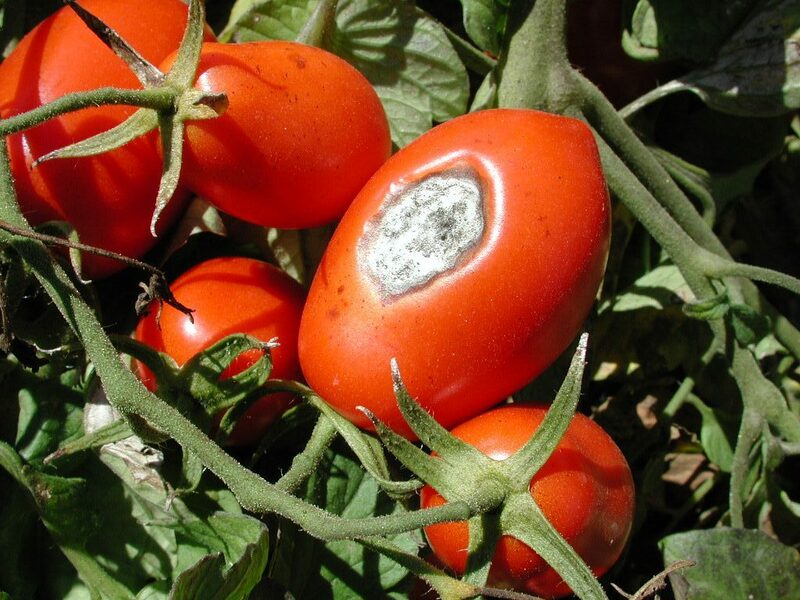 For information on registered tomato fungicides for Ontario, see OMAFRA’s Vegetable Crop Protection Guide. Always read and understand the label before using any crop protection product.